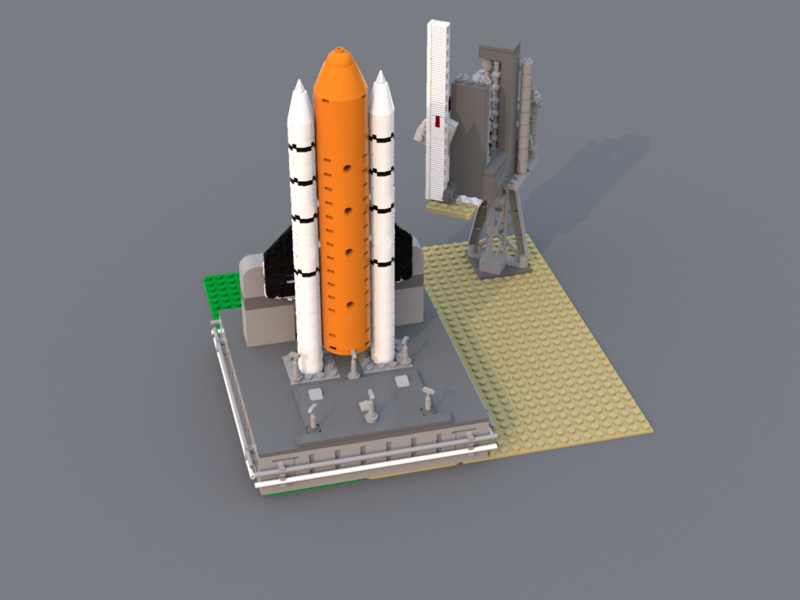 Big Redesign Coming Soon, A Bigger Space Shuttle, And Progress on my 1:110 Scaled Space Collection! 220+ supporters! Thanks a bunch! 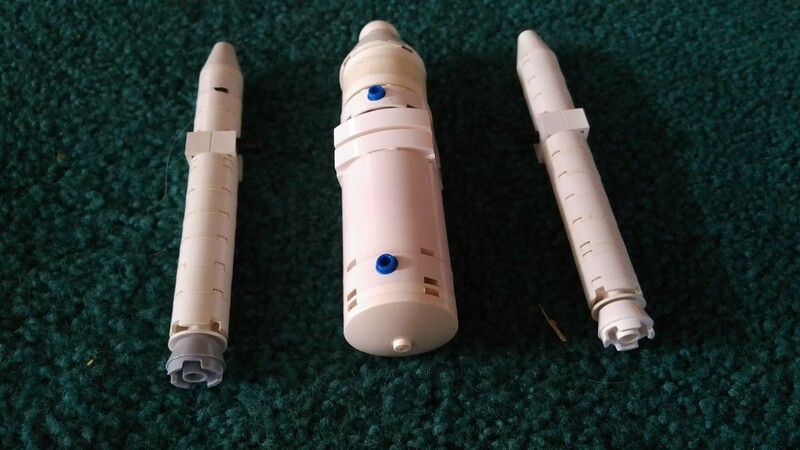 I've been working a lot on my 1:110 (which is the same scale as the Saturn V set) scaled Space collection. 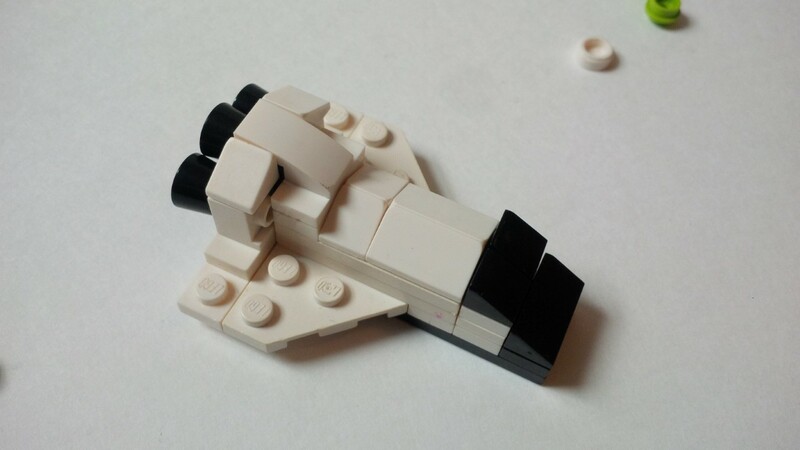 KingKnight made a really cool Space Shuttle, but it wasn't approved. 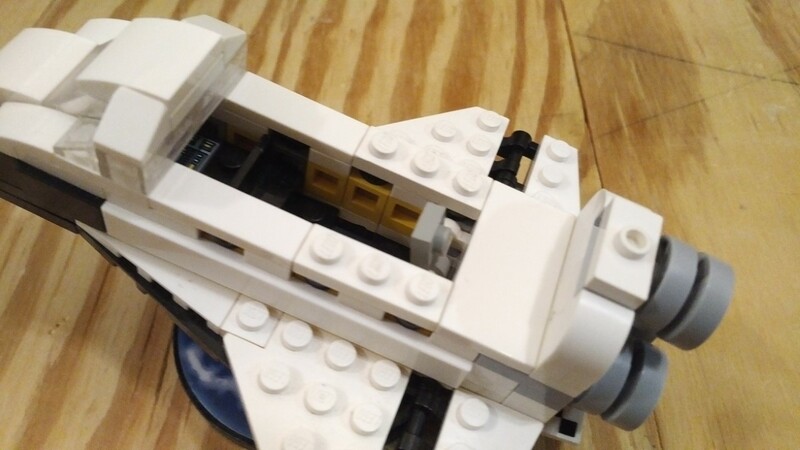 Since then, KingsKnight, Shiva/Blue-Blackfox, and shopsmart/luxordeathbed have worked together to make a much improved Space Shuttle. 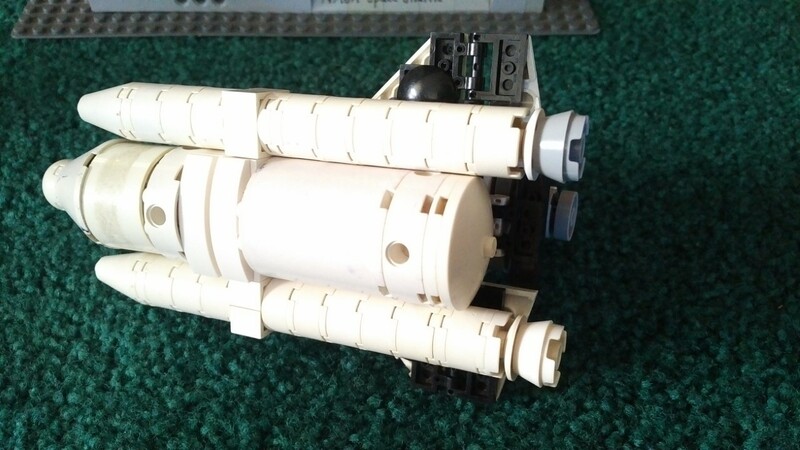 The ET (External Tank) Is the most improved part. 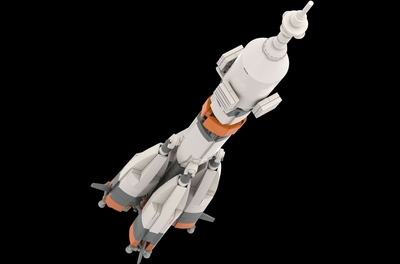 On page 4 of KingsKnight's 5-page Eurobricks thread (https://www.eurobricks.com/forum/index.php?/forums/topic/152554-moc-lego-ideas-space-shuttle-saturn-v-scale/&page=5), he has released building instructions for the Orbiter, ET, SRBs, and a simple display stand. 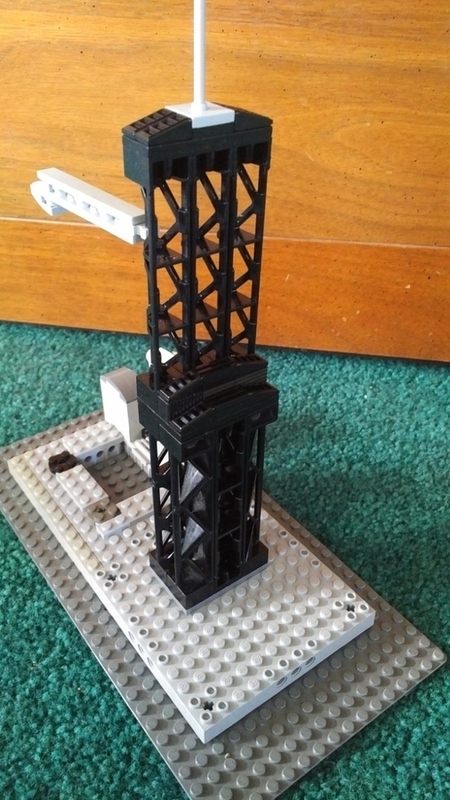 A while later, on page 5, he released building instructions for a segment of the MLP, so you can display it vertically in a more realistic way. 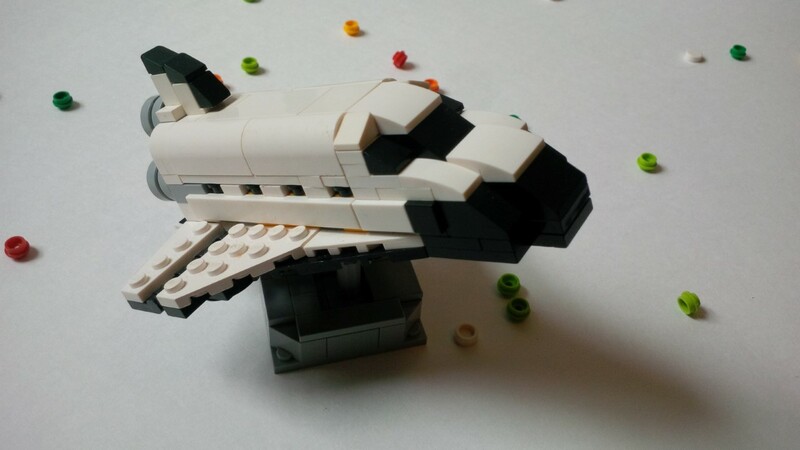 So, I built a 1:110 Orbiter. Most of it was my own design (I've deen using that phrase so much, maybe I should create a new abreviation: MOD = My Own Design. 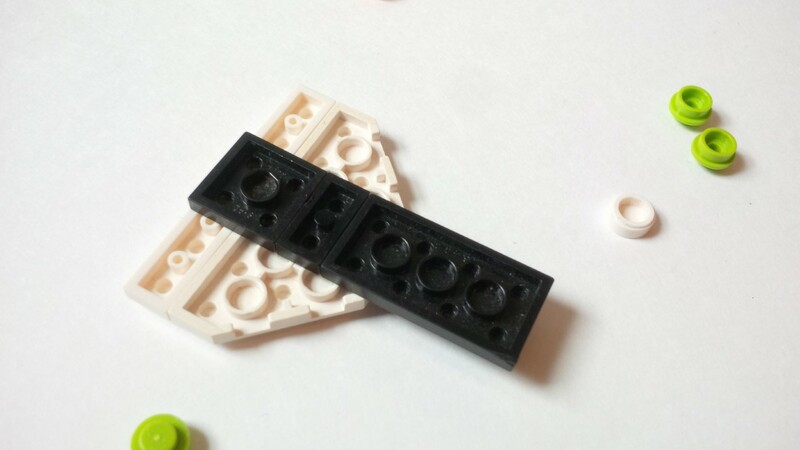 I guess it's basically teh same as MOC though. ), but a partially followed KingKnight's design. 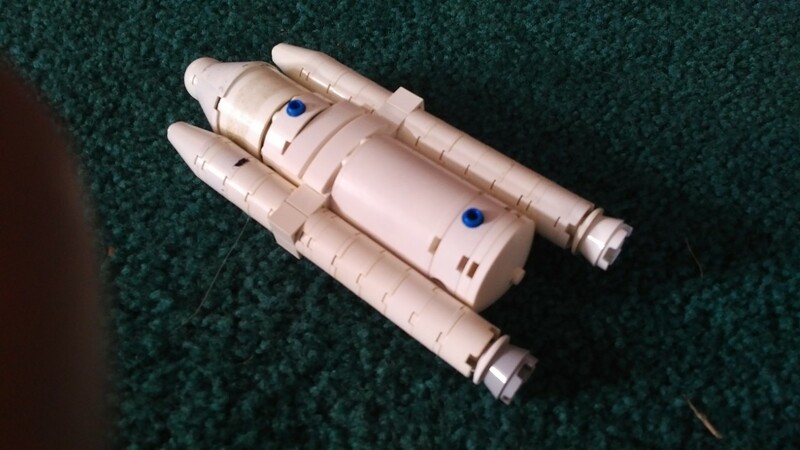 After building a larger or more accurate Orbiter, I realized how boxy and unrealistic my small version was. Not for long though! 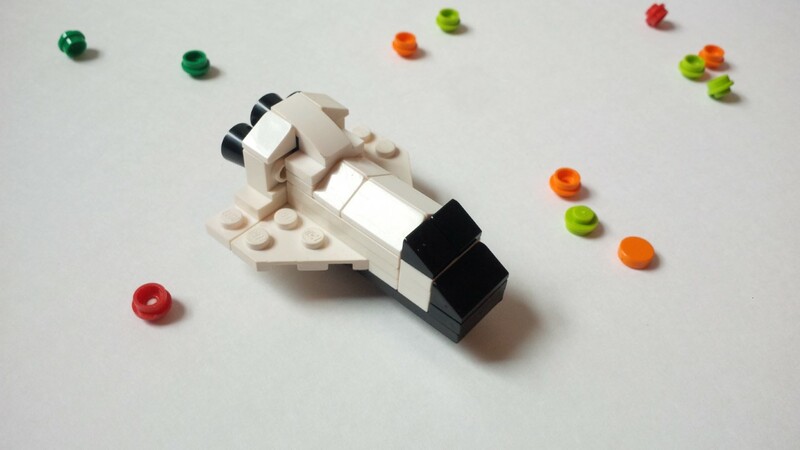 Coming soon, an updated, rounded, sleek Space Shuttle. I will also update the wings, giving it a wider and more realistic wingspan. 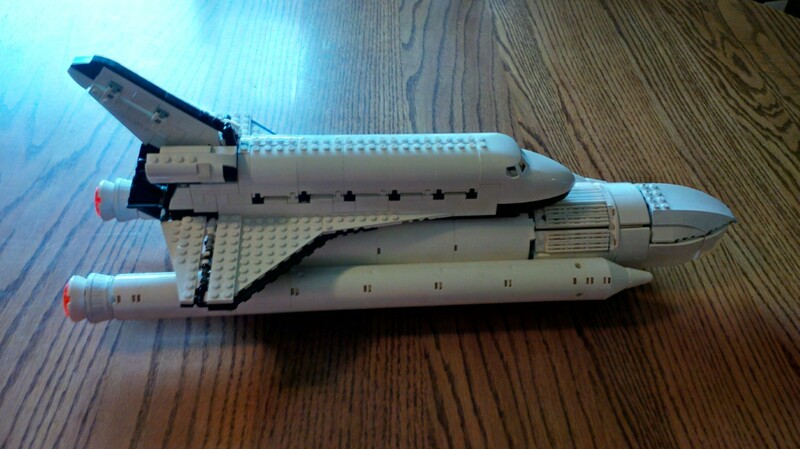 Also coming soon; The Space Shuttle in the colors of the STS-1 and STS-2 missions. 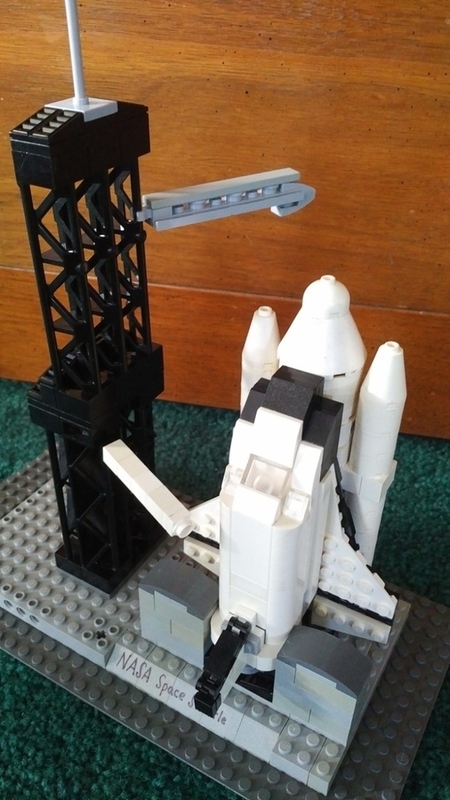 For the first two launches, the ETs were painted white. 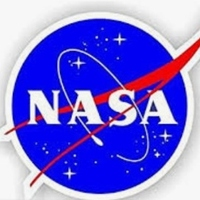 Then NASA realized that there was no difference between orange and white as far as heat shielding, so NASA stopped painting the ETs to save a few tons of paint. There were also a few other color diffences between the STS missions and the later missions. 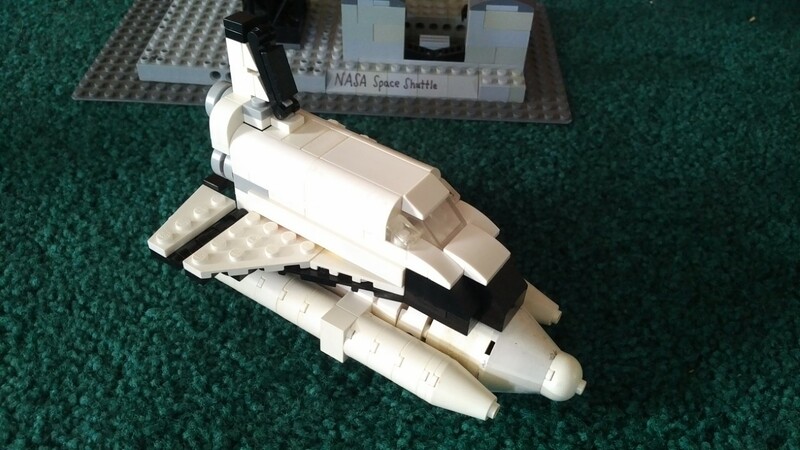 So now I had a 1:110 scale Orbiter. 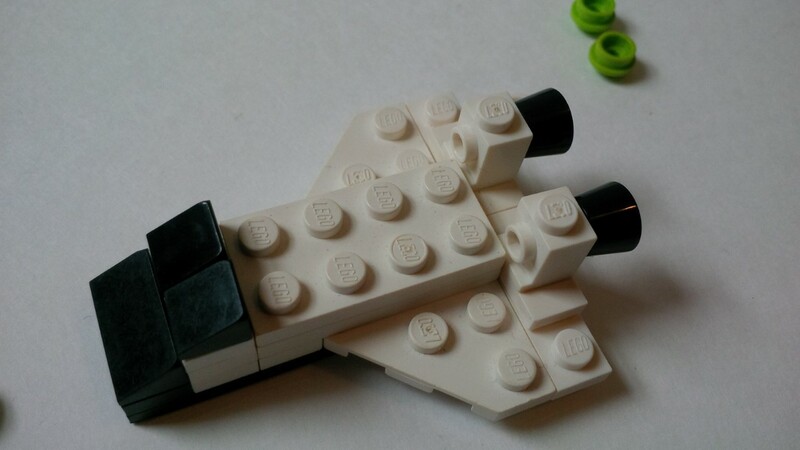 But no ET or SRBs? Something wasn't right. Just as my wallet was getting over me spending on the Orbiter, BAM! 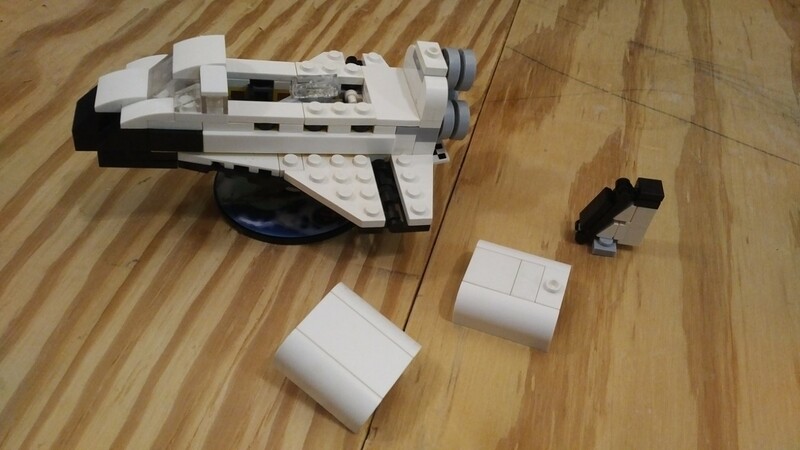 I tore it up once more and bought a few parts for the ET (Of course, that's modestly speaking. More like, "I bought a few hundred parts for the ET"). 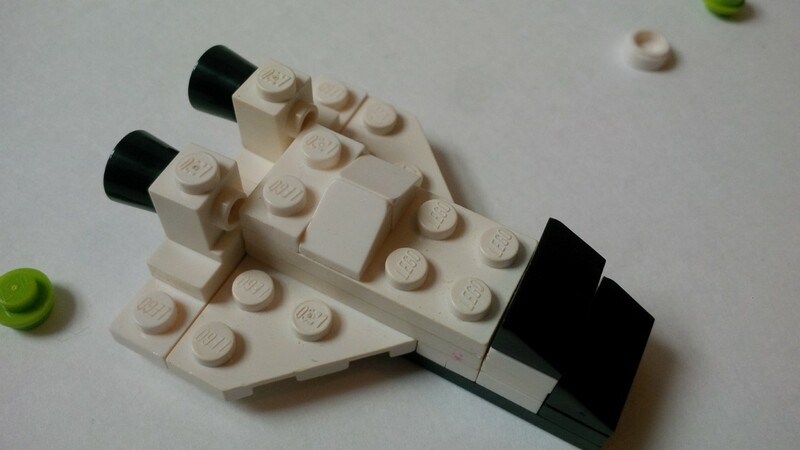 I already had the cylinder halves for the SRBs. It's not entirely done yet, but today I nearly finished the ET. Another order or two (ones already on the way), and it will be completely finished (at current half the ET's nose is missing). 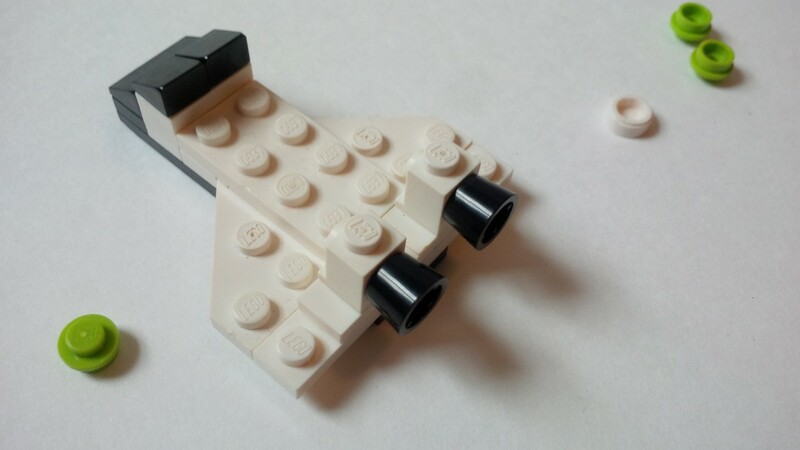 NOTE: The Space Shuttle pictured is NOT the Space Shuttle from this project. It is not an Ideas project (although on the outside it looks very simalar to KingsKnight's project). The updated version of this project is not yet complete. Several months ago. I started a BIG project (not an Ideas project): Build a 1:110 scale LUT (Launch Umbilical Tower) for the Saturn V With over 11,000 LEGO elements and nearly 4 feet tall, this would be no easy task (the 4 foot tall would include Eiffleman's NASA Crawler-Transporter project. So it would be a rollout scene). Yeah yeah yeah, I coulda been lame and followed Whatsuptoday's instructions, put that's plum lame. Besides, I didn't want to spend all that money on the parts (my wallet readily agreed). 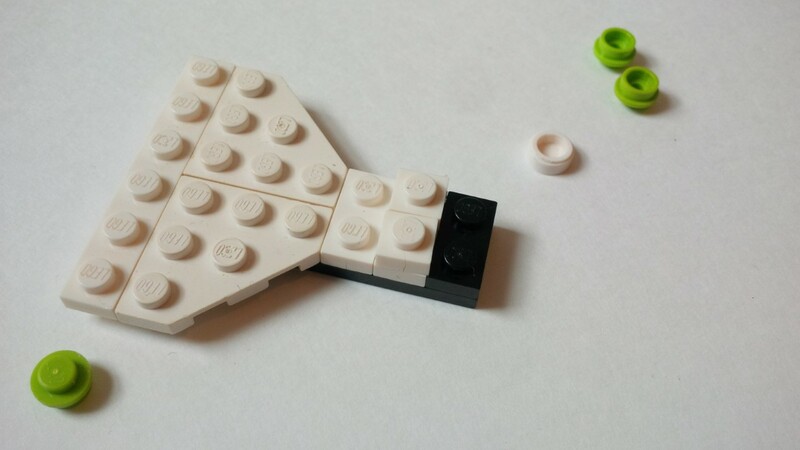 Plus, one of the main points of my challenge to myself was that I was going to come up with a design so I would be able to order as few bricks as possible. That meant scavenging for every last 1x2 red brick, every last read plate, every last gray brick, and so on. At last, after months of planning, building, failing, and rebuilding, I'm ready to take the next step: Order the parts. 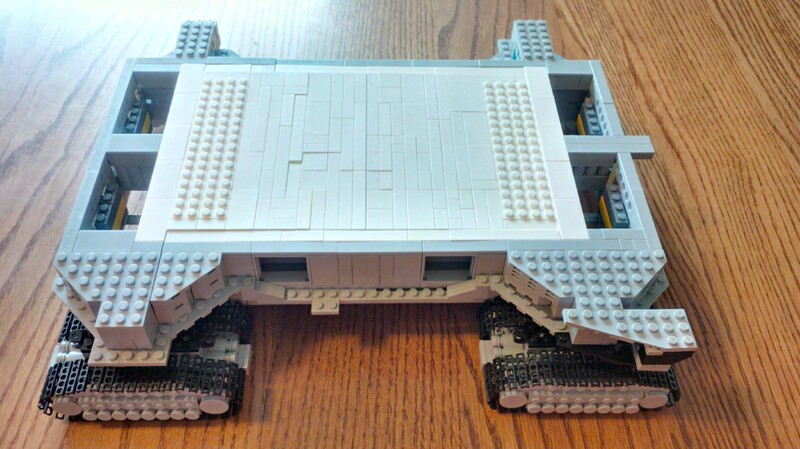 I have by no means used all the bricks I have (I think that would be impossible. 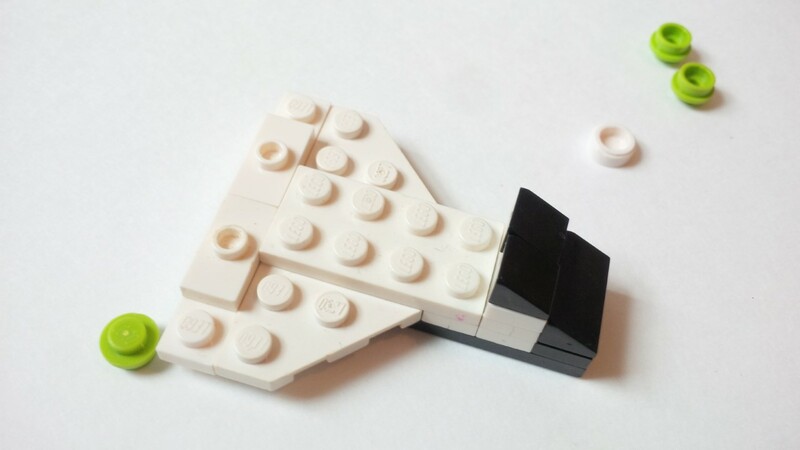 Building over a million (no joke) bricks into MOCs would be tough alright), but in some cases I have to order some bricks before I can use others. 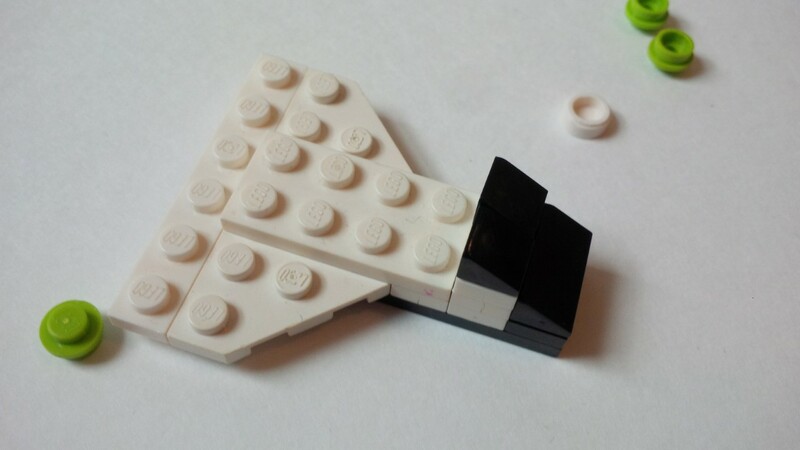 For example, I'm out of red plates; That means that I can use my red bricks, because I need plates under the bricks. Make sense? I hope, because I'm no good at explaining this stuff with out an example of real bricks in front of me. That's getting OT though. Ummm... Where was I? Well, you get the point about the LUT: It's big, and takes a lot of work, especially when you're making up a MOD (Ha! I like the sound of it). 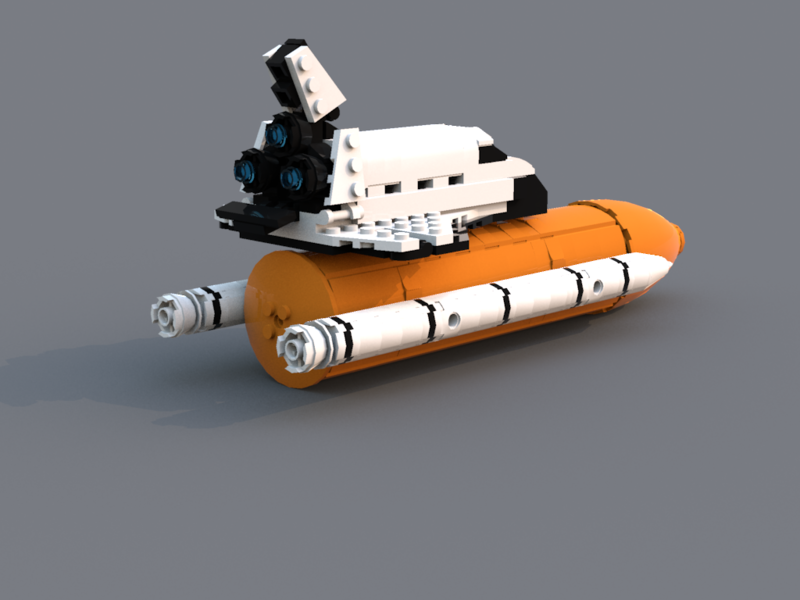 So since my LUT would be part of a rollout scene, I had to have a Crawler. Eiffleman's of course! He's a great builder and pays very good attention to strength and scale: Two very essential requirements. 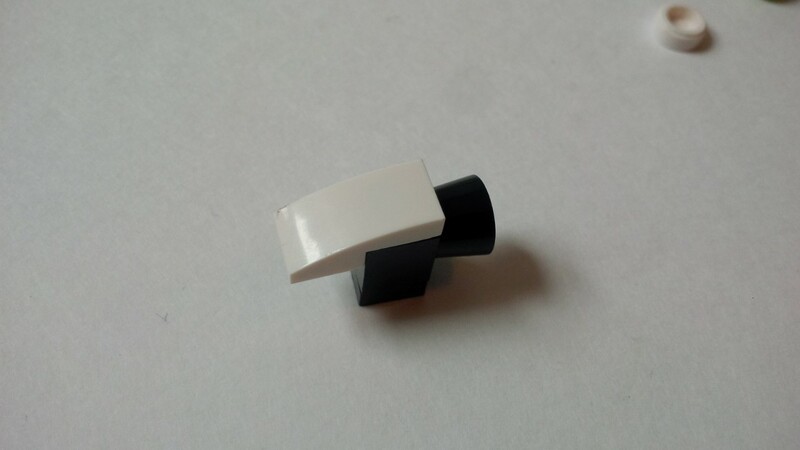 And he's realeased BI (Another spur-of-the-moment new abreviation: stands for "Building Instructions") in the updates. It doesn't get a bit better! 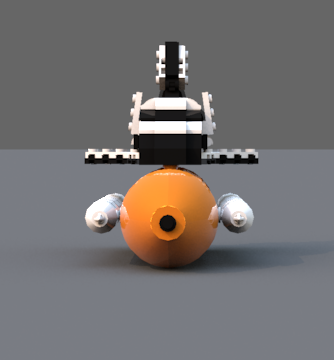 So I started that before I started the LUT actually, and it's very close to finished: just needs a few touchups here and there and a few angle bricks and gears (the pictured side is the good side). 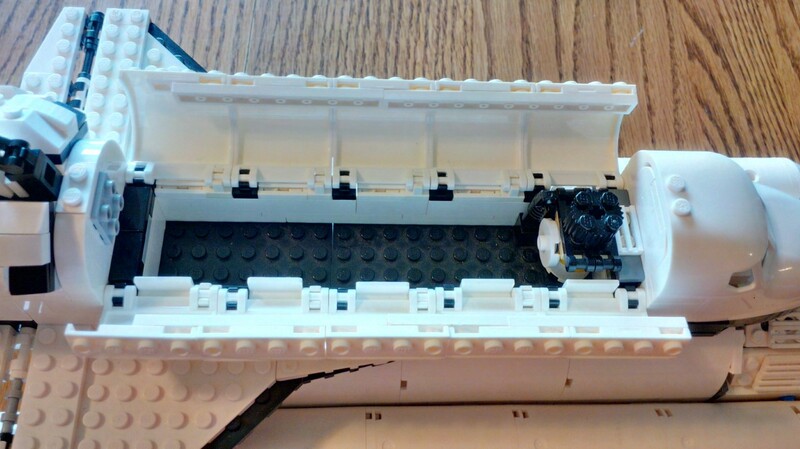 I chose not to build the interior of the Crawler, just because my wallet was really getting annoyed. 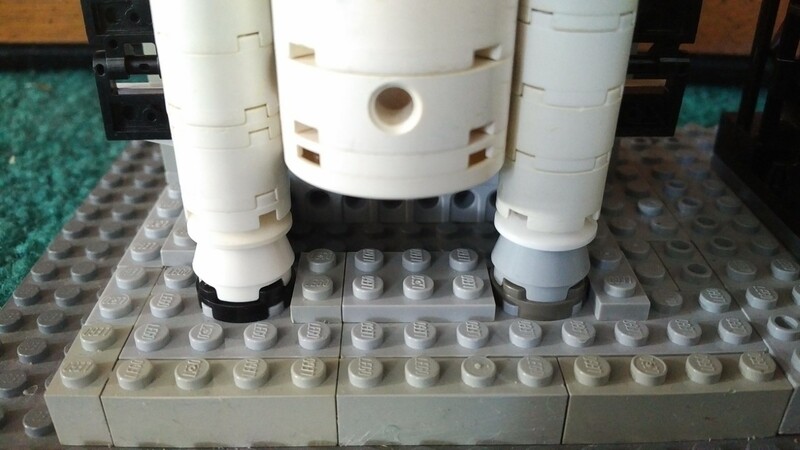 I've modified the CT (Crawler Transporter) with studs on the top so the MLP (Mobile Launcher Platform, which is what the LUT sits on) fits onto the crawler with an elaborate design using plates and baseplates. 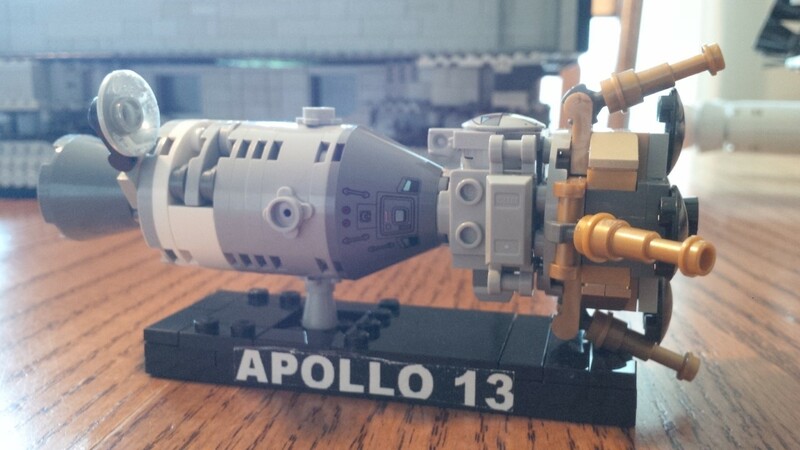 One more small thing: As a bonus build on his Skylab project, Eiffleman made a little Apollo 13 display. I don't have all the Technic pieces, but I took the idea and built a little display stand and modfied my extra CSM for it. On the back (second pic) are the names of the CSM and LEM. Well, that's about it! Thanks again! Finally, in closing, I would like to share how I came to Ideas. It's a very short and simple story, but here it is anyways. One evening, I was sitting on my laptop bored out of my mind. 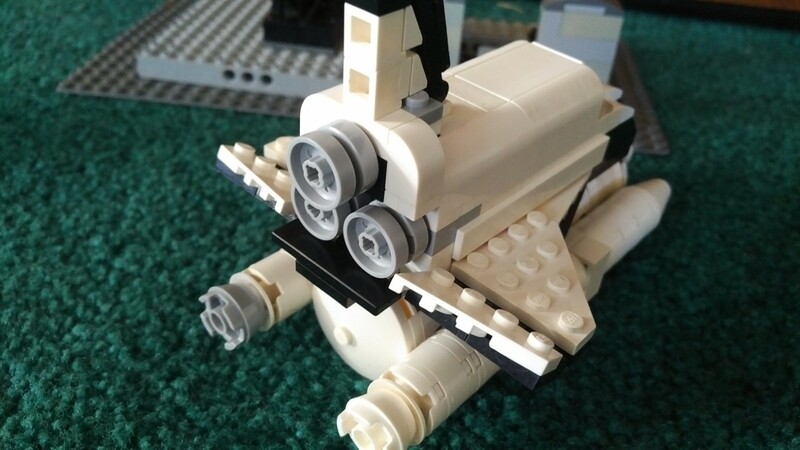 Having posted reviews on every LEGO set I owned (hey, what else was I supposed to do? 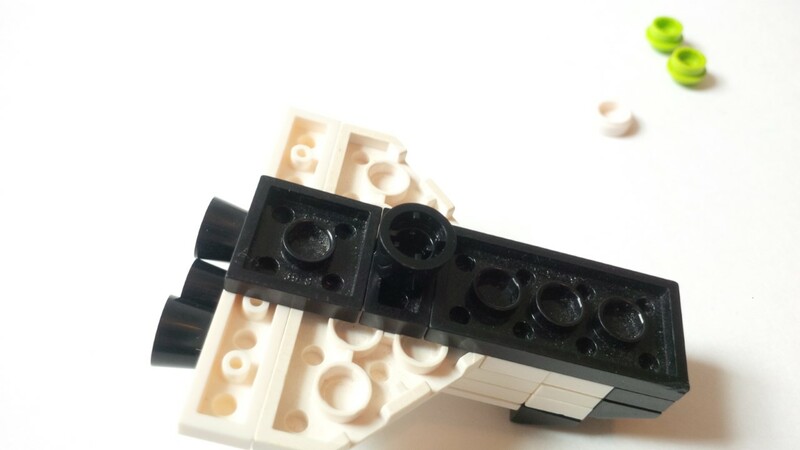 ), I decided to email LEGO. 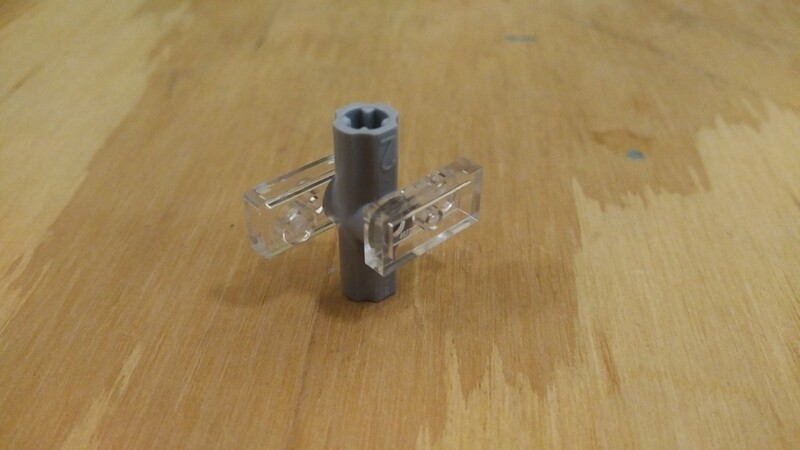 I told Customer Service that they should amek a Speed Champions set with a Dodge Challenger Demon, a Dodge Charger Daytona, a Dodge Viper, a car hauler, and a RAM REBEL TRX. A few days later, which was a Sunday evening, I was again bored out of my mind. I checked my email, and noticed I had a new email form LEGO Customer Service, which was a reply to my previusly mentioned email. 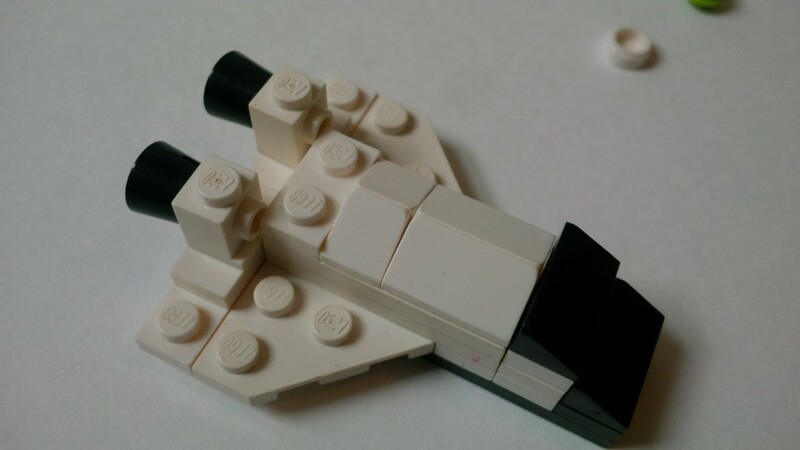 In the email, Customer Service suggested that I build one myself and post it on LEGO Ideas. Included was a link to the Dashboard. I followed the link, and created my account. 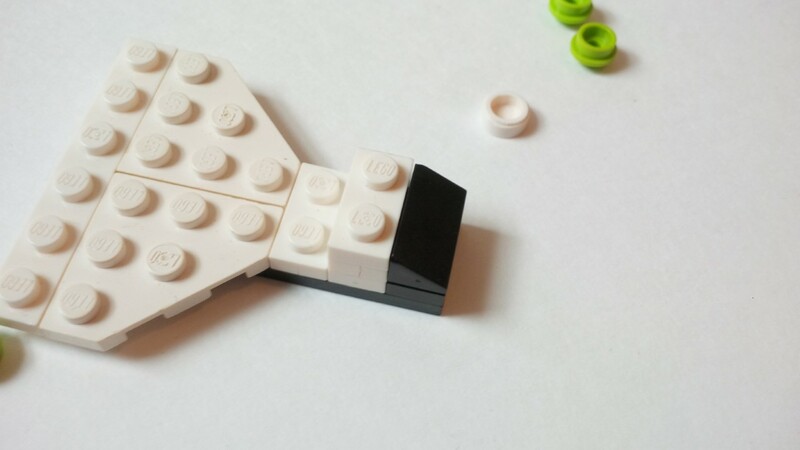 It took some getting used to, and at first I didn't get it at all and sent a very rude email to LEGO Customer Service telling them that. Now I wish I hadn't. 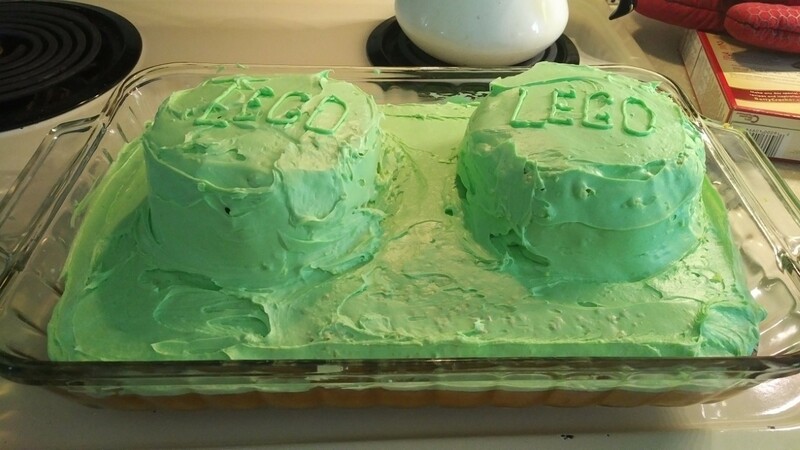 Anyways, LEGO never responded, but over time I got used to the site. 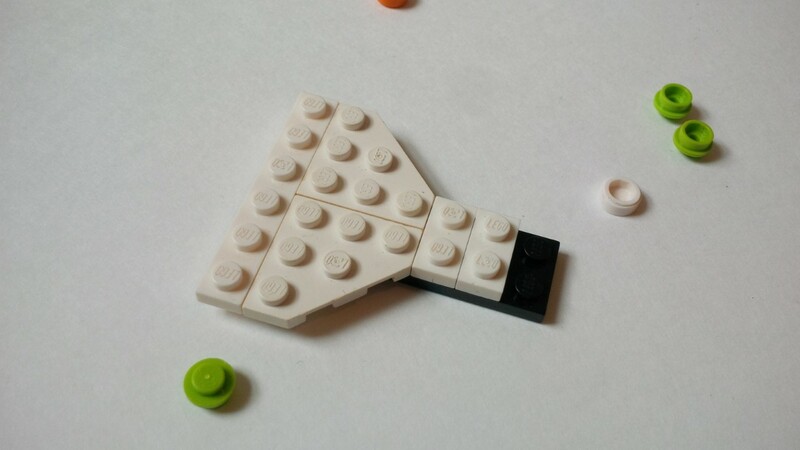 And ever since then, I have browsed LEGO Ideas nearly every day. That's probably not really a good thing at all, but that's beside the point right now. So there you have it. The very, very short and boring story of how I came to Ideas. 200+, Getting The Word Out, & Bonus Build! Thank you SO much for the support! I realize that to most people, 200 isn't a lot, and, to tell the truth, I don't think this will make 10k. But for me, just thinking about the fact that 200 people have gotten behind my project, and taken the time to comment and support. All of the constructive critisicm has helped a lot, and you can be sure that several big updates are in store for this project. With about 7 months left, This will, of course, have to be resubmitted. 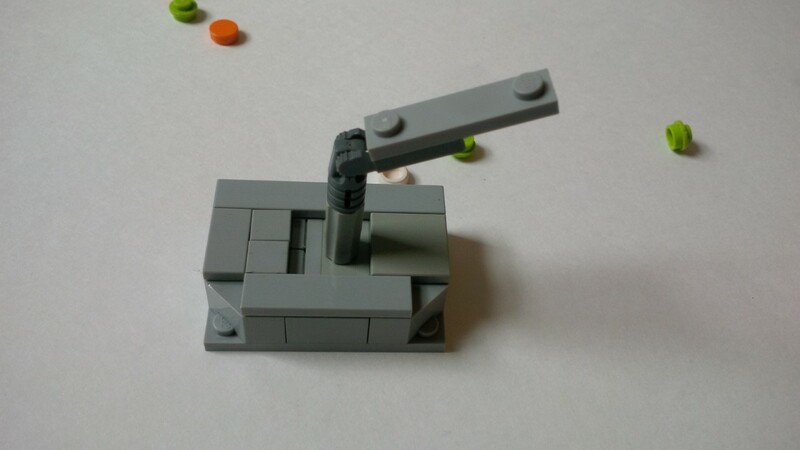 I'm actually surprised that this has gotten so much support with the main image being the first prototype of it. We have come so much farther then I ever suspected we could, but hopefully the resubmission will do even better. 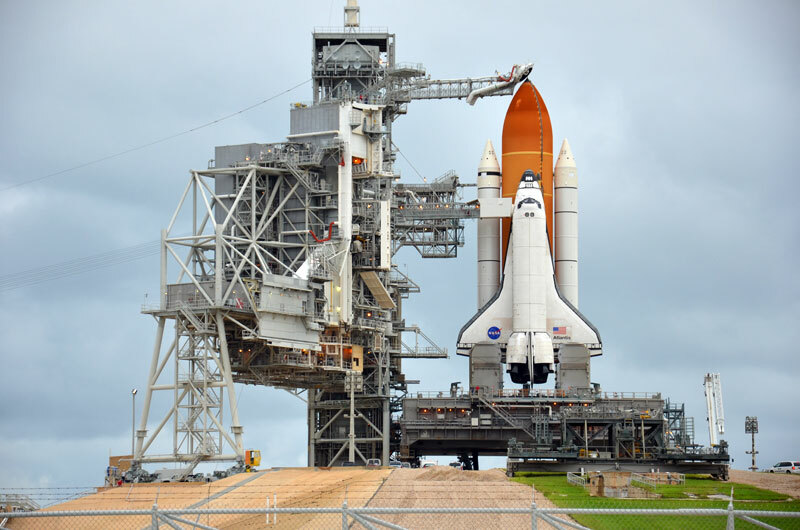 According to plan, the resubmission will include the following: MLP (Mobile Launch Platform), Crawler Transporter, Launch Tower, and, of course, the Space Shuttle. 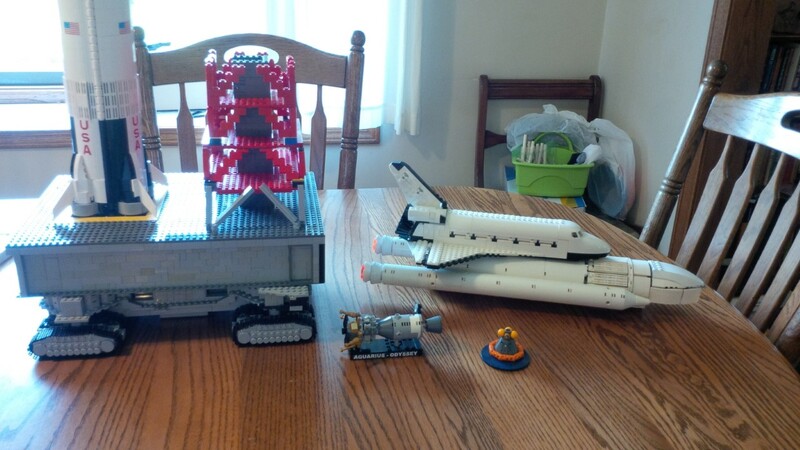 All of this will be scaled to 1:165 scale. Recently, I've been working more in getting the word out about this project. As you can see in the comments tab, I put together an image with a bit of info. You're welcome to use it to get the word out if you can. My Dad, (a.k.a BiltOfBriks) and my oldest brother (a.k.a peteinmichigan), have been very helpful with this. Both have shared the project on their Facebook pages, and my brother put up the image I made about it at the camp he works at (by name, the camp is Student Statesmanship Institute, or SSI. It is located in Lansing, MI). Both have brought a number of supports to the project. Thank you very much, BiltOfBriks and peteinmichigan! 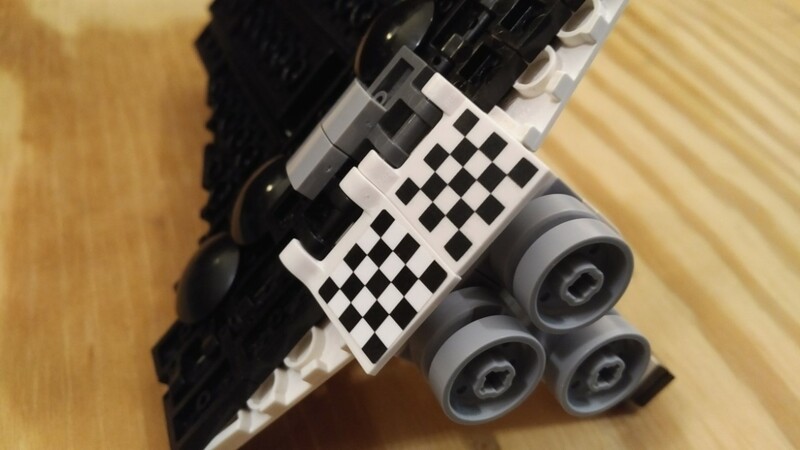 NOTE: The black Fez piece on the bottom of the Bonus build is not needed. It's just there to act as a sort of stand. 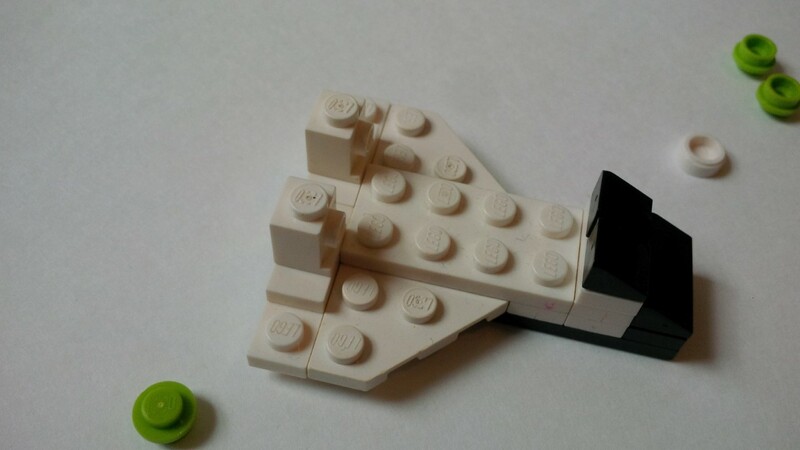 Also, As you may have seen in the previus image, I have made a new stand to display just the Space Shuttle. 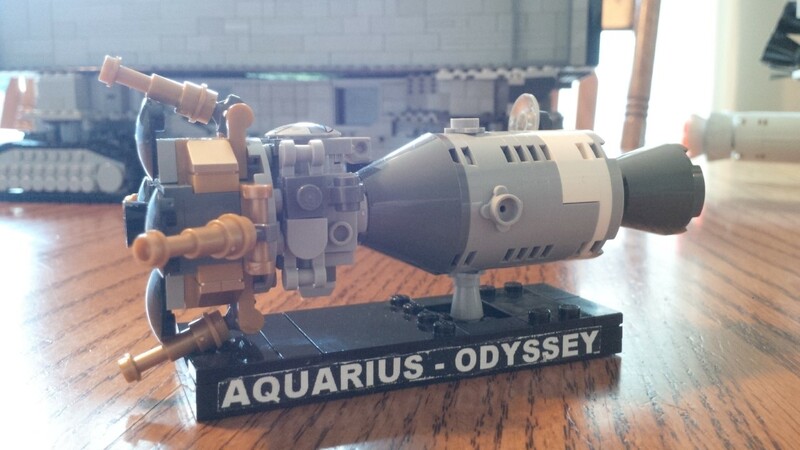 Of course, this leaves you with no use for your External Tank and Rocket Boosters, so I have brainstormed an idea for how to display them. Not to forget about my other project, be sure to check it out HERE if you haven't already! Thanks again for your support, and stay tuned for more updates! 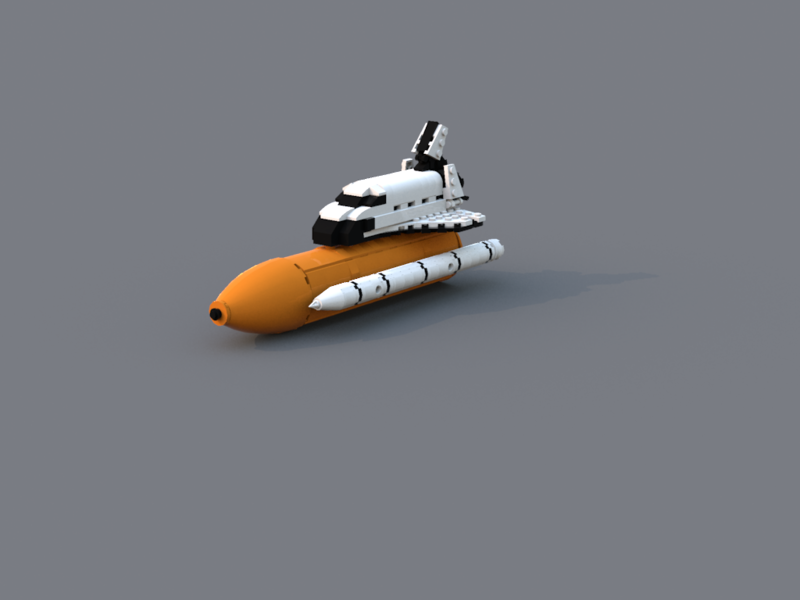 I've always thought the External Tank was too small, but untill now I hadn't found a solution. 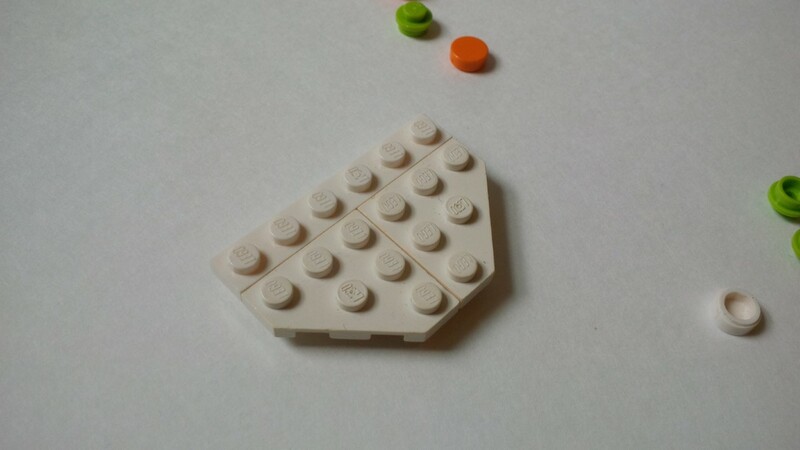 I tried 6x6, but it was a little too big, so I decided to use SNOT (Studs Not On Top) to create one that was about 5 and a half studs wide. It worked perfectly. 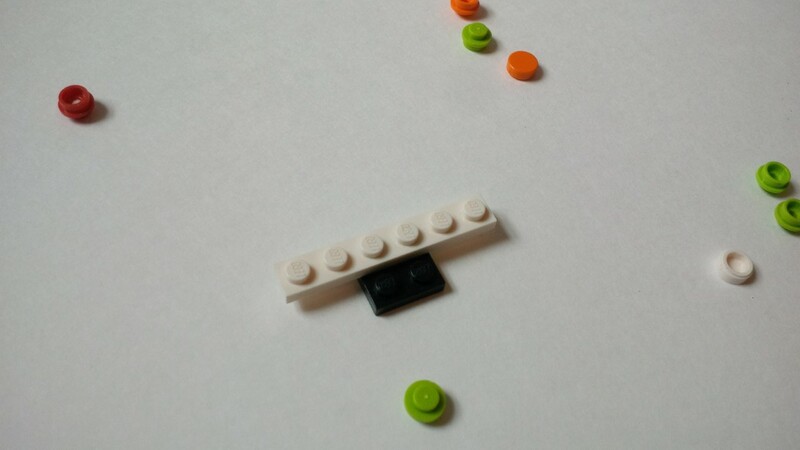 Also, it adds something extra and something more complicated to the project. 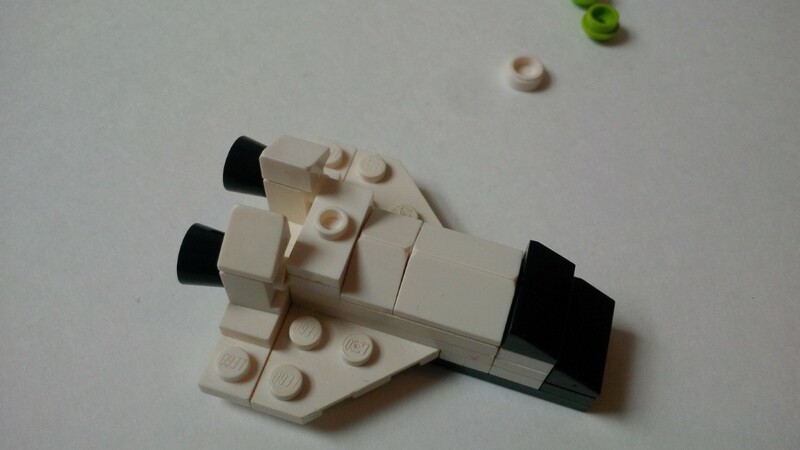 The issue I am now facing is the Rocket Boosters. 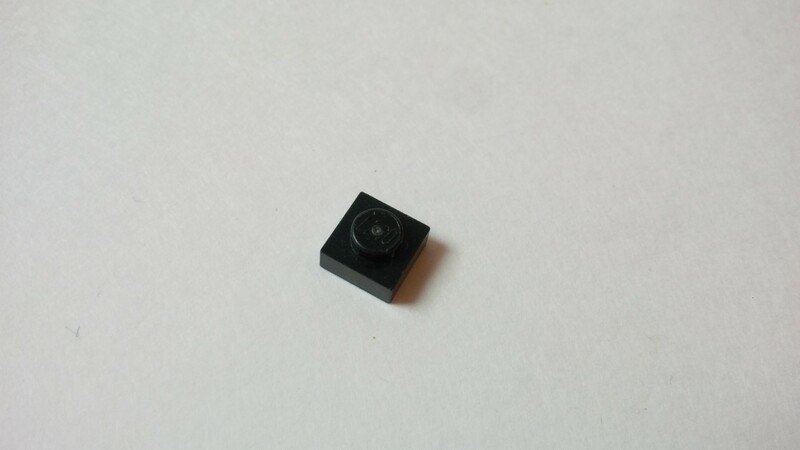 2x2 is too small. I'm pretty sure that 3x3 will work though, so stay tuned! Also any advice from anyone who has experience with 3x3 is welcome. 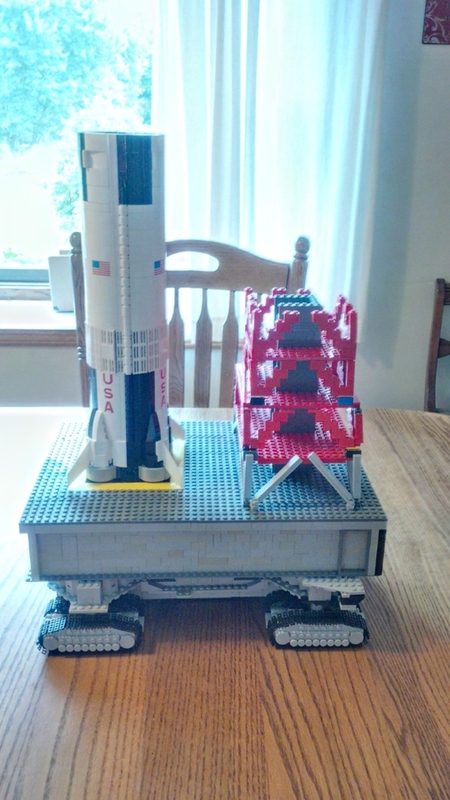 In the meantime, I have plenty to keep me busy for a while with the launch tower. 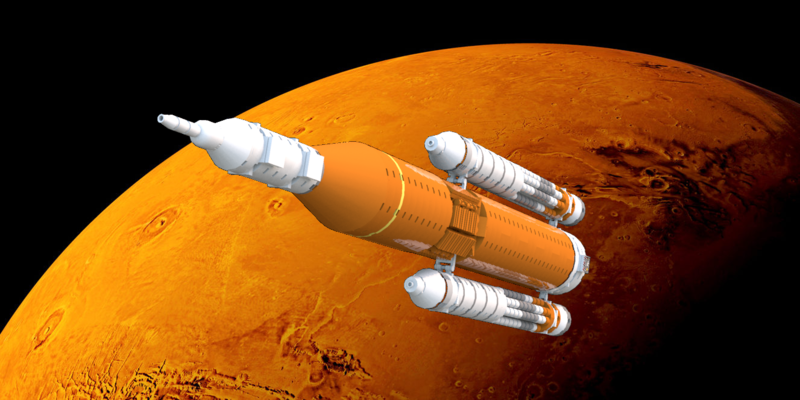 NOTE: The MLP is currently undergoing some serius modifications to accomodate the new External Tank. The revised version will be posted here in this page. 181 supporters! A big thank you to each and every one of my supporters! 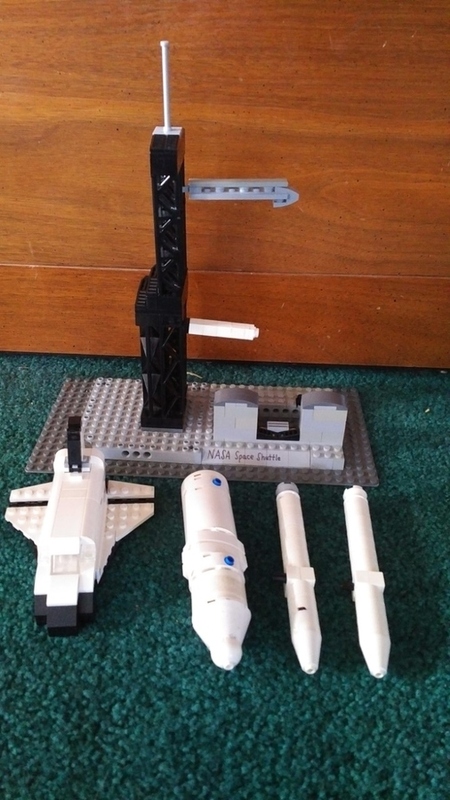 As you can see in the title I have completed the MLP (Mobile Launch Platform). 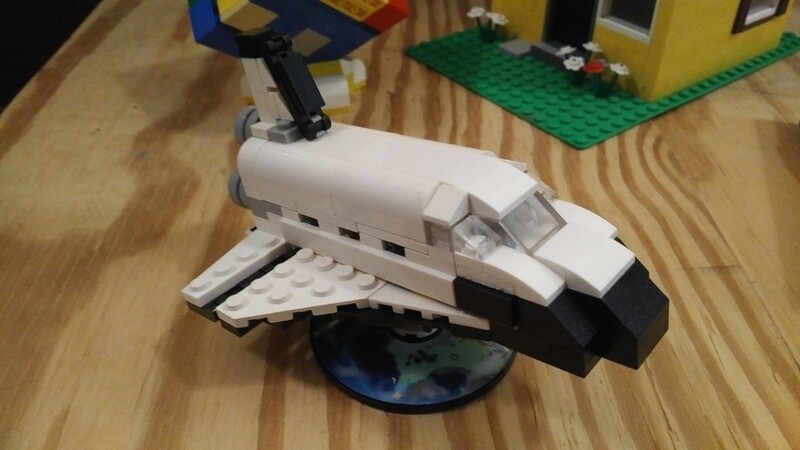 I know I didn't mention it before, but I realized that it is impossible to recreate a whole launch and not have the MLP. 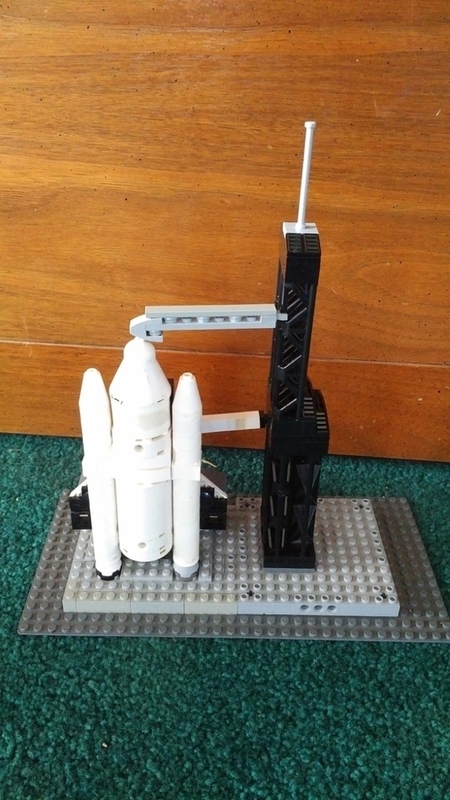 Now I will will be working entirely on the Launch Tower. 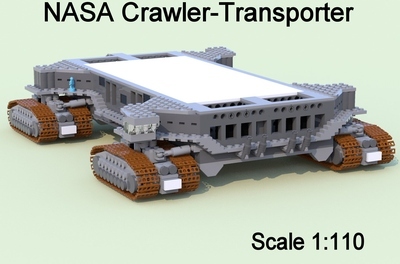 After that, more likely then not I will build a Crawler-Transporter, which is the powerful crawler that would carry the Shuttle on the MLP to the pad. Thank you very much for your generosity and support, and at 200, just for fun, I will tell how I came to Ideas (it's a very short story, but I decided I'll do it anyways). 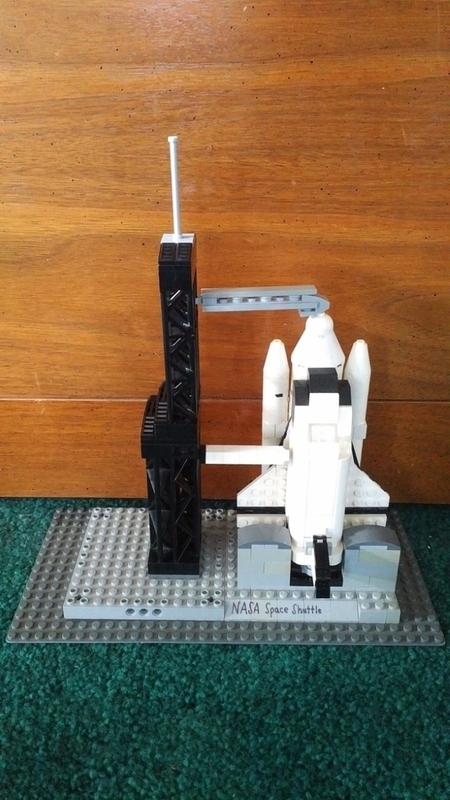 I've talked a little about building a launch tower for the Shuttle. I must admit, I'd dropped it for several months. I've picked it back up now though, and I wanted to show everybody a pic of the progress. 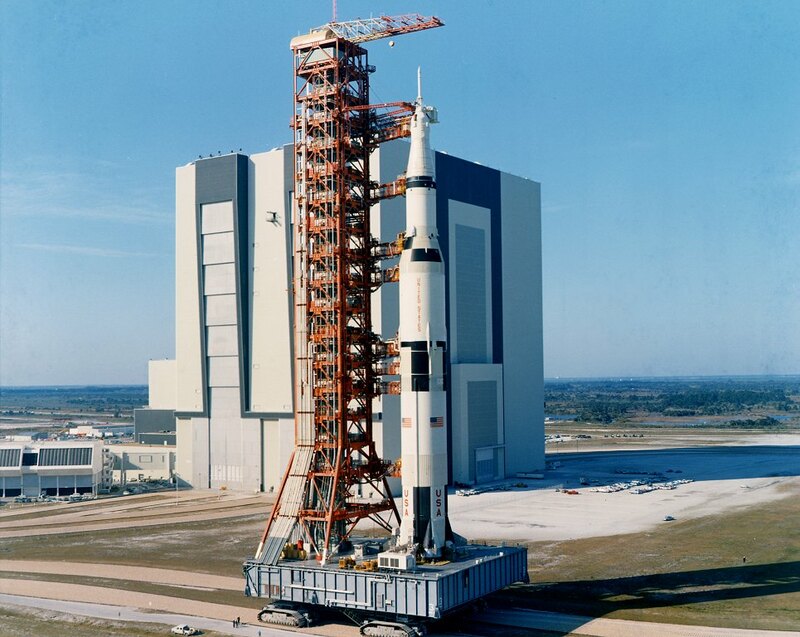 Also, attached is a pic of the real launch tower. 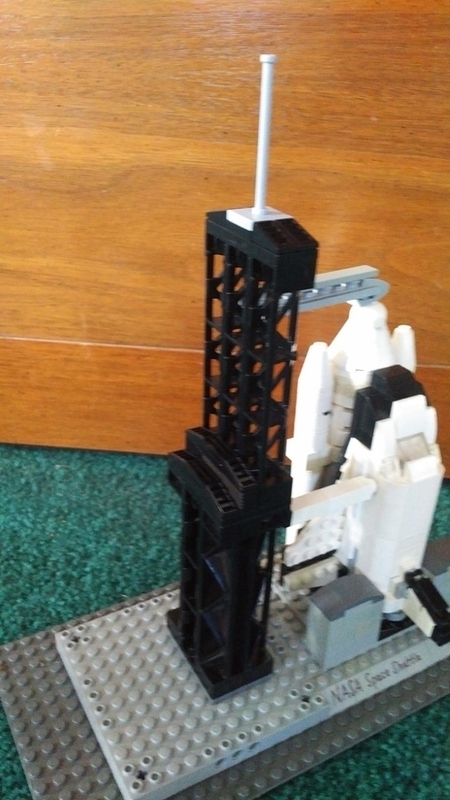 NOTE: I am basing the tower off the Atlantis's tower. 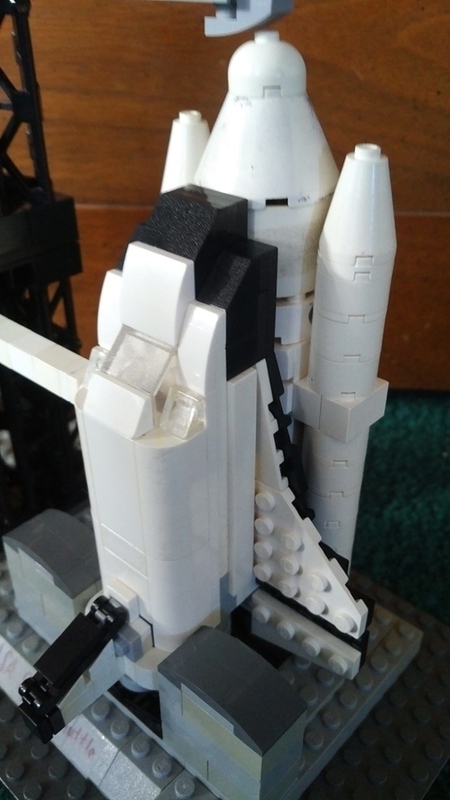 Different shuttles may have slightly different towers. 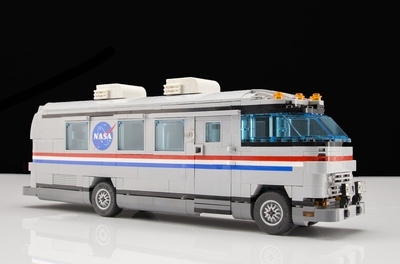 Also, I'm considering making a Crawler-Transporter in the scale of the shuttle. Physical Model: Lots Of Updates! 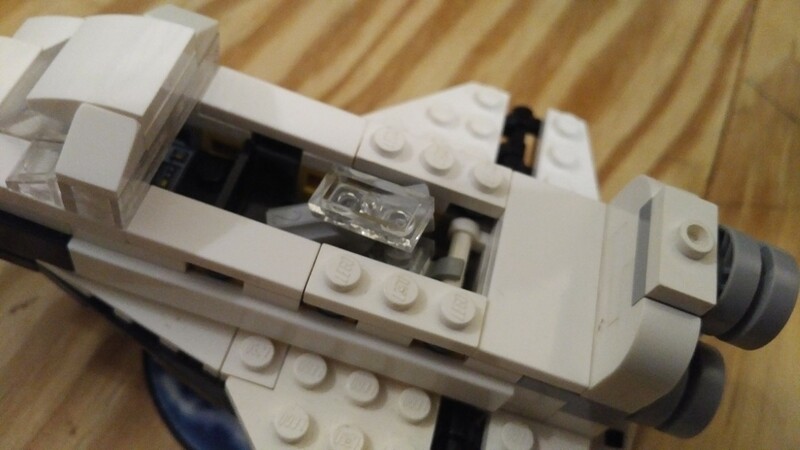 About a month ago, I added some interior stuff to my digital model of the Space Shuttle. I wanted to show you that in this update, but I'm having some trouble finding the right file. Maybe later I can upload some screenshots or renders. 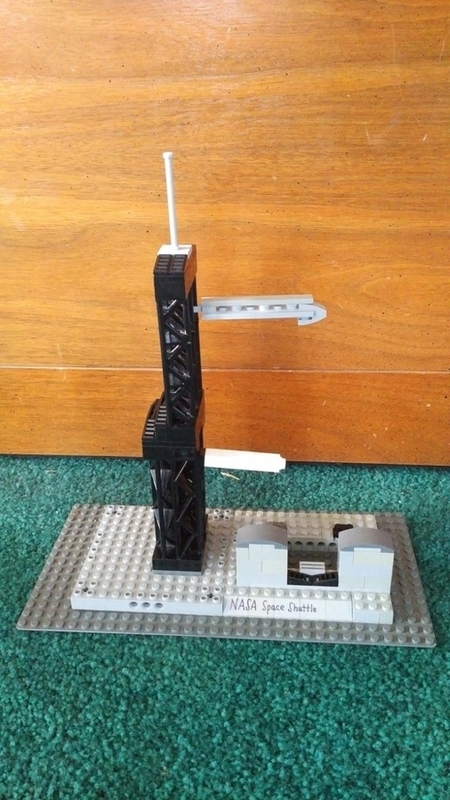 Anyways, so I started messing around with the physical model, and I figured out a way to make the top of the bay removable and fit a little satelite in it. 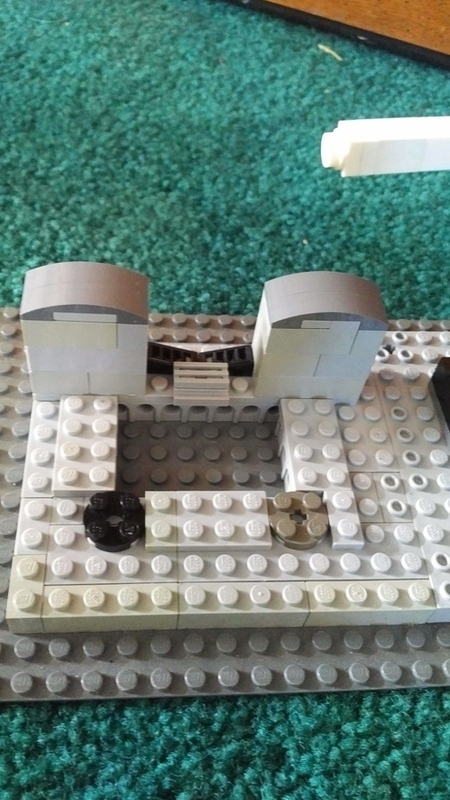 I managed to do that, and I made a little spot where microfigure can go, even though microfigures are way to big for this scale (I ordered some microfigures that should be coming in the next week or two). 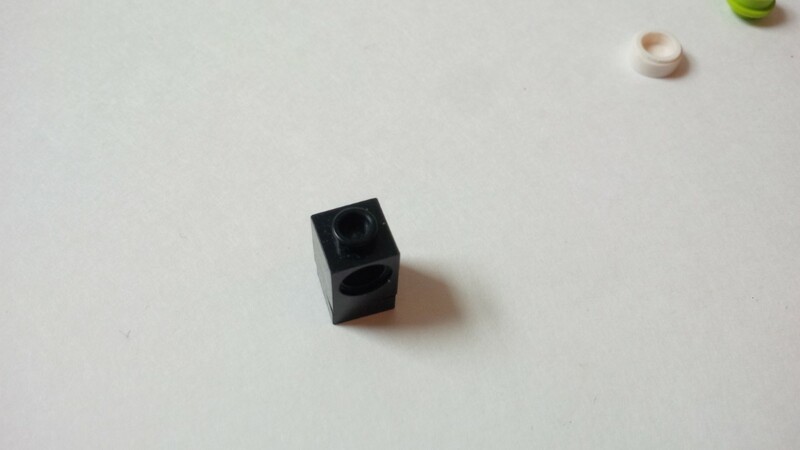 Also, I found a way to make the body flap a lot thinner and smaller. I currently have to use racing flags as a substitute for black flags, but hopefully that can change later. So, I hope you like it, and I'm always open to comments and suggestions! Thanks! 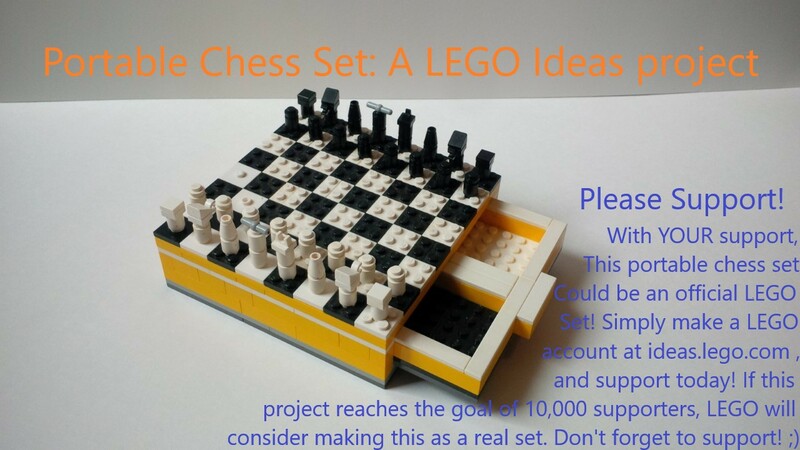 Please Support This Project by smileyguy! Hello every body, and first of all, thank you so much for the support!! In all, We've gained 38 supporters since I last updated this project, And now we've earned 365 more days! It took us only one month to get to 100! Thanks for looking, and please share this with your family and friends!